If you happen to host your own photo gallery using Piwigo or Gallery and you use an Android device, you have almost everything you need to replace TwitPic, yfrog, or any other third-party mobile photo sharing service with your own DIY solution. Using the ReGalAndroid app, you can not only browse photos in your photo gallery, but also snap pictures, upload them to the gallery, and share them via microblogging services like Identi.ca or Twitter. To connect ReGalAndroid to your photo gallery installation, launch the app, press the Menu hardware button on your Android device, tap on Settings, and configure the required settings, such as Gallery type, Gallery URL, Username, and Password. While you can upload photos from ReGalAndroid to an existing album in your gallery, you might want to create a separate album for your mobile snaps. You can do this either in the gallery itself, or directly from ReGalAndroid using the Menu | Create a new subalbum button. Uploading snaps from the Android device to the gallery is easy. Use the Menu | Take picture and send it to gallery button to launch the built-in camera app, take a snap, and push it to the gallery. 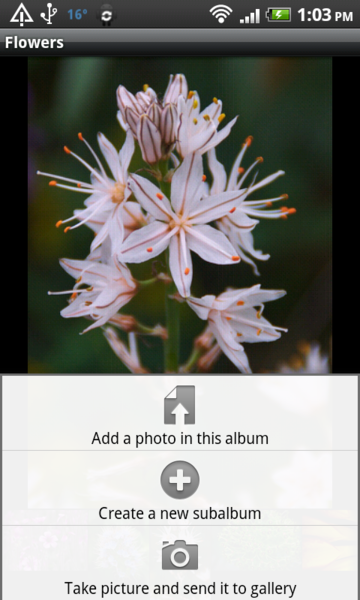 Alternatively, you can upload an existing photo stored on your Android device using the Menu | Add a photo in this album button. Finally, to share the uploaded photo via Identi.ca or Twitter, open the photo in full-view mode in ReGalAndroid, press the Menu | Share this photo url button, and pick your preferred microblogging app from the list of sharing actions.